The Masonic Shoe also called the Blue Slipper, is symbolic of a physical confirmation of a spoken deed. To unloose one's shoe and give it to another was the way of confirming a contract in ancient times. In the Book of Ruth in the Christian Bible, we read that Boaz, (a wealthy land owner and Solomon's Great Great Grandfather,) having proposed to the nearest kinsman of Ruth to exercise his legal right by redeeming the land of Naomi, which was offered for sale, and marrying her daughter-in-law. The kinsman being unable to do so, resigned his right of purchase to Boaz. "Now this was the manner in former time in Israel concerning redeeming and concerning changing, for to confirm all things; a man plucked off his shoe and gave it to his neighbor: and this was a testimony in Israel." Therefore, the kinsman said unto Boaz, "Buy it for thee." So he drew off his shoe. The reference to the shoe in the First Degree is symbolic of a Covenant (a promise) to be entered into. Discalceation: Discalceation is the ceremony of the removal of both shoes as a token of respect when we are on or about to approach holy ground. Exodus 3:5: The angel of the Lord, at the burning bush, exclaimed to Moses: "Draw not nigh hither. Put off thy shoes from off thy feet, for the place whereon thou standeth is holy ground." Josua 5:15: "And the captain of the Lord's host said unto Joshua, Loose thy shoe from off thy foot; for the place whereon thou standeth is holy." 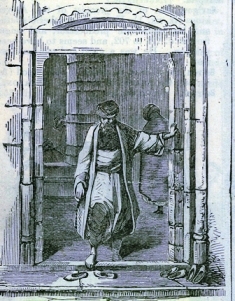 The Rite of Discalceation has always been and is still used among the Jewish people and other Oriental nations when entering their temples and other sacred edifices. Pythagoras to his Disciples: (in Greek) translated as: "Offer sacrifice and worship with thy shoes off." Mohammedans: When Mohammedans are about to perform their devotions, they always leave their slippers at the door of the mosque. Druids: The Druids practiced the same custom whenever they practiced their sacred rites. Ancient Peruvians: The ancient Peruvians left their shoes at the porch when they entered the magnificent temple consecrated to the worship of the sun. One Family? Adam Clarke, author of Commentary on Exodus, believes that the custom of worshiping the Deity, barefooted, was so general among all nations of antiquity that he assigns it as one of his 13 proofs that the whole human race has been derived from one family. Simon-Sez: I found that very interesting because the scriptures say that from Abraham, came all the nations of the world. Scientific proof takes longer, perhaps. I think Bishop Patrick, in his Commentaries, said it best. Bishop Patrick: His comment on the origin of the Rite of Discalceation was: "Moses did not give the first beginning to this Rite, but it was derived from the patriarchs before him, and transmitted to future times from that ancient, general tradition; for we find no command in the law of Moses for the priests performing the service of the temple without shoes, but it is certain they did so from immemorial custom; as do the Mohammedans and other nations at this day." The information, above, is credited to Mackey's Revised Encyclopedia of Freemasonry, Volume 1, page 937, 1929. Simon-Sez: Is the Masonic Shoe a Masonic symbol? Yes. But, once again, we find that the Masonic shoe is another Masonic symbol which did not originate with Freemasonry, but which was taken from traditions of antiquity as documented in the Holy Books. Is that disappointing? No. It simply once again, shows us the brotherhood of man through the ages, which Freemasonry exemplifies. 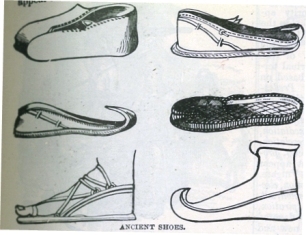 It is noteworthy to remember that in ancient times, shoes as we know them, today, were not available. Both men and women wore sandals. The blue slipper was probably a sandal of some type. Why do we use the term "Blue Slipper" when most sandals are made of brown leather? The answer lies in learning the true color of Masonic blue. © Copyright 2007-, Masonic Lodge of Education.com Masonic-Lodge-of-Education.com participates in Google's Adsense advertising program, Amazon's affiliate program, affiliate programs through Shareasale, and others.